I’m a strong believer of balance. Ebb and flow. Ying and yang. Sun and moon. That’s why it just never made sense to me how diets like the Atkins Diet or the Grapefruit Diet could ever work in a healthy manner. If we think back to the caveman days, I just don’t picture any of them saying, “Sorry…no mammoth today. Please pass the grapefruit juice.” It seems un-natural for us to completely eliminate entire food groups in an attempt to lose weight. Does not compute. The Full Plate Diet takes a different approach to dieting. Instead of focusing on eliminating certain foods, they want you to eat MORE of healthy, fiber-full foods. The idea behind the Full Plate Diet is that by eating more fiber (40+ grams per day,) which is naturally found in fruits, vegetables, whole grains, beans and nuts, during the first part of your meal, you will become fuller faster, thereby eating less which means eating fewer calories. It actually makes perfect sense if you think about it. Don’t worry about “don’t eat this, don’t eat that.” Simply eat more of this apple first, which will fill you up and then you won’t even have room for that cookie you’re trying to avoid. 1. The Full Plate Concept – Eat more dietary fiber! It makes you feel full, which means you’ll eat fewer calories which will help you lose weight. 2. The Big Health Benefits – Fiber has many health benefits, including helping to lower your risk of heart attack, stroke and diabetes. It can also help with digestive problems and heartburn. 3. Starting Where You Are – You can enter The Full Plate Diet at one of three stages, depending on your current fiber intake. Each stage helps to achieve or maintain fiber intake to 40+ grams per day. This chapter also has a readiness assessment checklist, plus a couple of tips to help get you committed to the diet. 1. Eat more fiber foods. 3. Stop eating when you no longer feel hungry. 5. Top 5s & Honorable Mentions – Want to know what the best fiber foods are? This chapter lists out the top 5 fruits, veggies, beans, nuts & seeds, and grains based on fiber content. They also include fun facts and health benefits for the different foods. For example, did you know that a sweet potato isn’t even a potato? It’s in the morning glory family. 6. Adding Fiber to Foods You Already Eat – You can easily get the 40+ grams of fiber simply by adding food power-ups to your current meals! The Full Plate Diet guide has helpful “fiber wheels” to help you see what foods you can add to that bowl of pasta to make it packed with fiber and delicious! 7. At the Office, Eating Out, & On the Road – This is the hardest part for me, but keeping your Full Plate Diet going is a lot easier if you bring your own lunch to the office. They also provide helpful tips for choosing the right meals at restaurants and while traveling. 8. Become a Nutrition Detective – Know which food items at the grocery store are “go ahead” green, “proceed with caution” yellow, or “are you sure you really want to eat that?” red with a useful chart that ranks various food items. 9. A Little Medical Talk – Have a question about salt, artificial sweeteners, and other diet issues? This section addresses 13 frequently asked questions about The Full Plate Diet. 10. Onward! – The final chapter provides some encouraging words to help you on your way. It also includes information about the authors. After going through, The Full Plate Diet: Slim Down, Look Great, Be Healthy!, I think the might really be on to something. People struggle on a daily basis to eliminate things we like to eat from our diets. By taking a different approach and focusing on adding healthier dietary fiber to our diets instead of cutting out other foods cold turkey (which always makes us want and crave those things more,) The Full Plate Diet seems like a diet which can be maintained. I like that you don’t have to count calories, count points, or worry about that brownie you ate while watching TV. The Full Plate Diet strives to achieve a healthy lifestyle by training you to eat more fiber first, which will naturally make you eat less of the unhealthy foods. 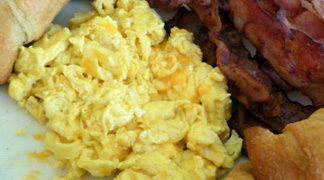 For more information about The Full Plate Diet, recipes, and other helpful tips please visit www.fullplatediet.org. If The Full Plate Diet sounds like it’s something you’d like to try, then you can purchase this useful book online or you can download a copy of the book FOR FREE from the website. Just a couple of cool things to know about the book. It is possible the only book I’ve ever seen on Amazon with almost 100% 5 star rating. It was also just announced that The Full Plate Diet made it onto the NY Times Best Sellers List. 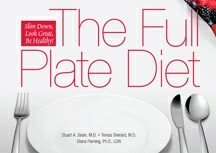 We also have a brand new copy to offer one of our What’s Cooking at DD readers in the WCatDD Full Plate Diet Giveaway! One winner will receive a copy of The Full Plate Diet: Slim Down, Look Great, Be Healthy! Disclaimer: This post consists of my (and/or fellow tester) opinions only. No compensation was given for this review/giveaway. I received a free copy of The Full Plate Diet from the manufacturer or their representing PR agency to use and test for the purposes of this review. This did not affect the outcome of this review. We may use affiliate links as a form of advertising in our reviews. The Last Minute Chili receipe sounds great. Awesome giveaway!! !